We do a lot of SEO work for clients but have never really done any for our own site. As such, we decided to have a little fun and do an infographic for our own site recently. We ended up scoring links from The Huffington Post, Business Insider, Inc, Entrepreneur and a range of the other internet big dogs. If you have so much as dabbled in SEO you know links back to your site are the single biggest ranking factor. The more sites that link back to you the stronger your site appears to Google. It’s a tiiiiny bit more complicated than that, but at its core, that’s how it works. The thing is, not all links are made equal. A link from a popular, well-known site is worth many multiples more than a link from a nothing site. This case study looks at the process behind creating and executing this campaign. 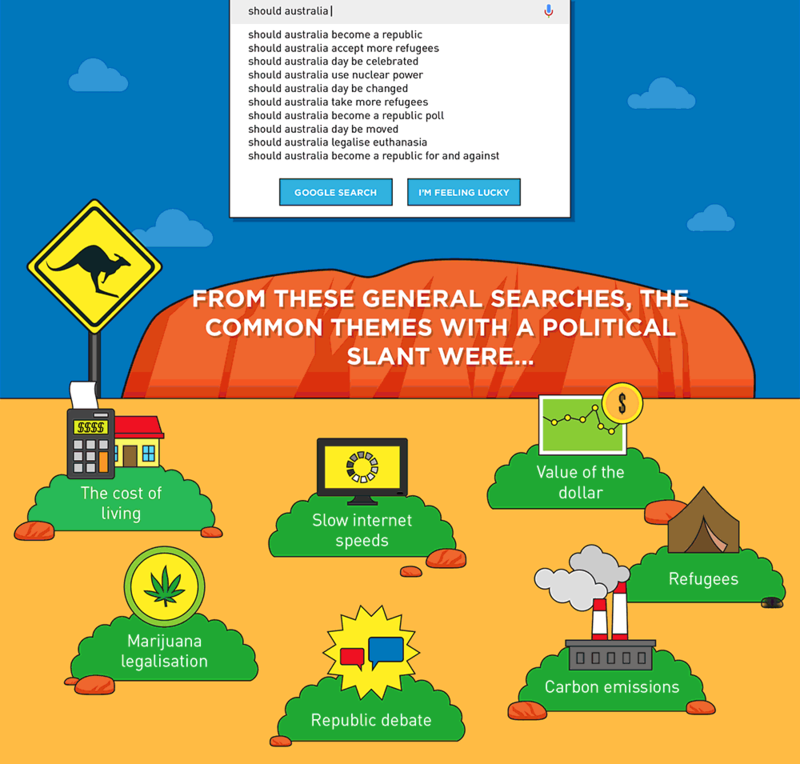 The general premise was that we used a range of Google tools to look at what Australians were searching in regards to politics in the lead-up to the federal election of 2016. This was a good topic as the federal election had a loooong campaign trail (something like 8 weeks) which meant a lot of time to promote it. The fact it dealt with politics meant we could capture interest from sites that wouldn’t normally have any interest in what a digital marketing agency had to say. 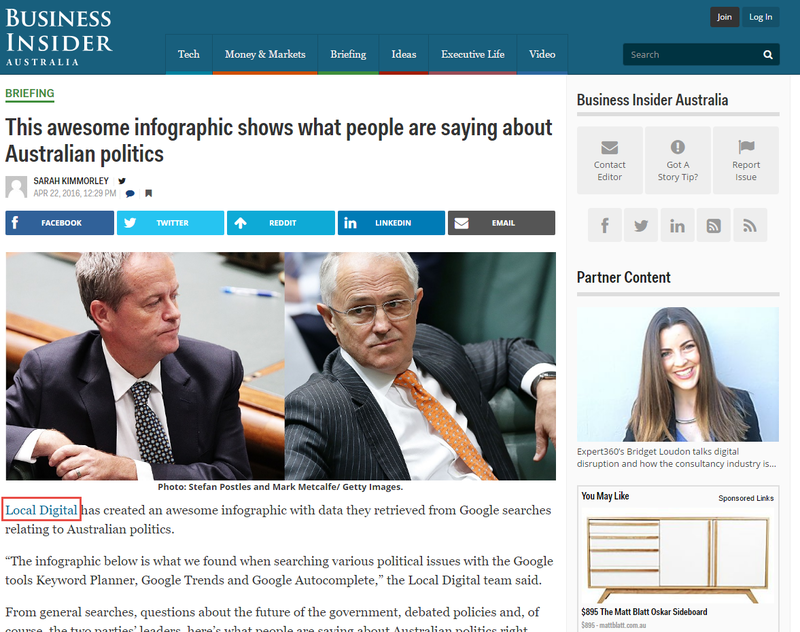 We were able to make the political theme relevant to what we do as a business by tying it into Google stats and the various tools we use to get the job done every day. These are all tools or features Google provides free of charge. We use them quite a lot when working on AdWords management and SEO consultancy campaigns for our clients. The bulk of the infographic was lead by the tool Autocomplete. The suggestions that it shows are mainly generated based on the volume of other people searching for them. Google keeps track of this and is able to show what else is commonly searched for. 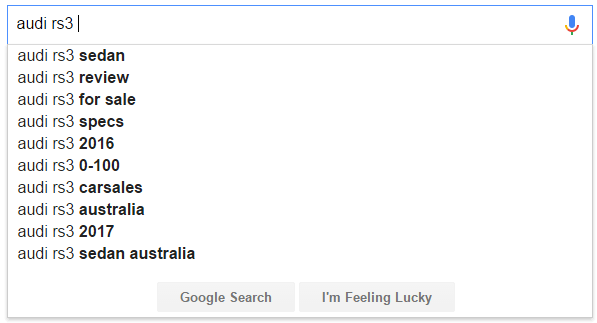 For the purposes of our research, we fed in phrases that would trigger Autocomplete suggestions related to Australian politics and issues. We started phrases like “should australia” “will australia” “does the australian” etc and kept track of all of the suggestions that came out. 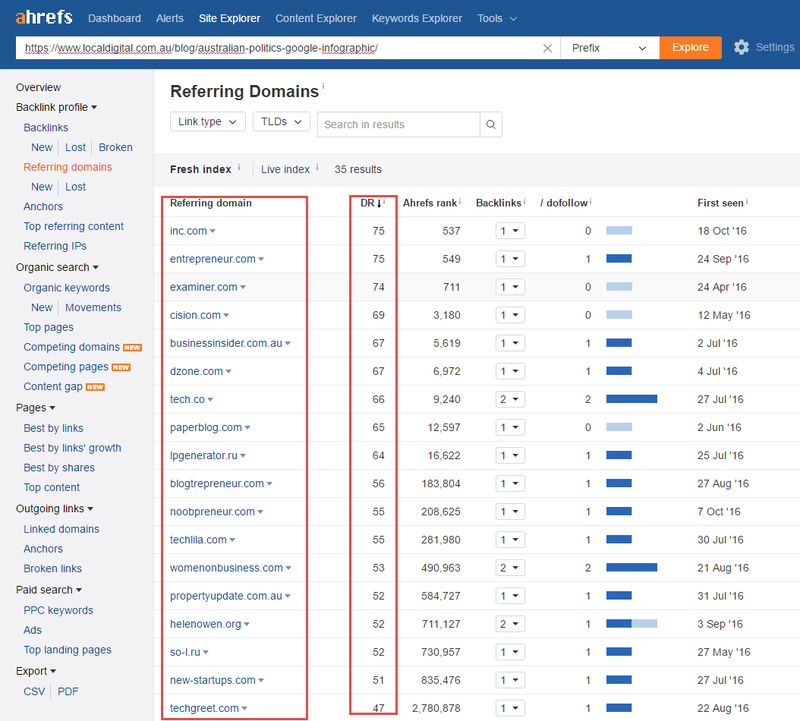 Any common themes were noted and then fed into two other tools, Keyword Planner and Google Trends. The Keyword Planner tells you how many times per month a particular keyword or phrase is searched, as well as the volume of searches for other related phrases. Google Trends tells you the interest in a particular keyword over periods of time (years, months, weeks etc). A good few hours of slicing and dicing these tools gave us the numbers and the general themes for our infographic. Once we had the data, it was time to figure out how to present it in a way that is enjoyable to consume. We fired up Google Docs and put together a script, which was essentially the bare-bones text and content to be included in the infographic. The idea was to make all the sections flow together, with just enough explainer text to support the images. In addition to this, we also prepared a detailed “design brief”. This document outlined what each element in the infographic should look like, along with reference links and materials. The end product was two very detailed documents that we could hand over to our design team, leaving them in no doubt as to what we wanted to create. Our designers then went and knocked it out of the park (in our opinion!). Once you have an awesome piece of content you can’t just post it to your blog and sit back and wait for the glory to roll in. There are over 2 million blog posts published every day. That’s a lot of noise to cut through. That’s why we made a concerted effort to really promote our infographic once it was completed. We have a fantastic outreach team here at Local Digital who prospect the web for relevant websites and form relationships with their owners. We use these relationships to promote our client campaigns. We got the most response for our own campaign through using that team to reach out to website and blog owners. No surprise there as it’s what we do daily for clients. In the lead up to the election, our team was persistent in finding sites, reaching out to them to let them know about the infographic and then following up. As I mentioned at the start of the article, we scored links from some of the biggest domains around. These are all very strong, well-established domains. In short, they’re powerful links. The kind that can have a strong impact on keyword rankings in Google (as we saw above). For example, below is a screenshot of a link we scored on Business Insider. This site has a DA score of 82 and a Majestic TF score of 35. These are strong metrics. It was a branded link (using our name as the anchor text) and was part of a well-written article created on the back of the infographic. Because we chose a broad topic (Politics) and broke the infographic down into sections, it appealed to many different website owners. 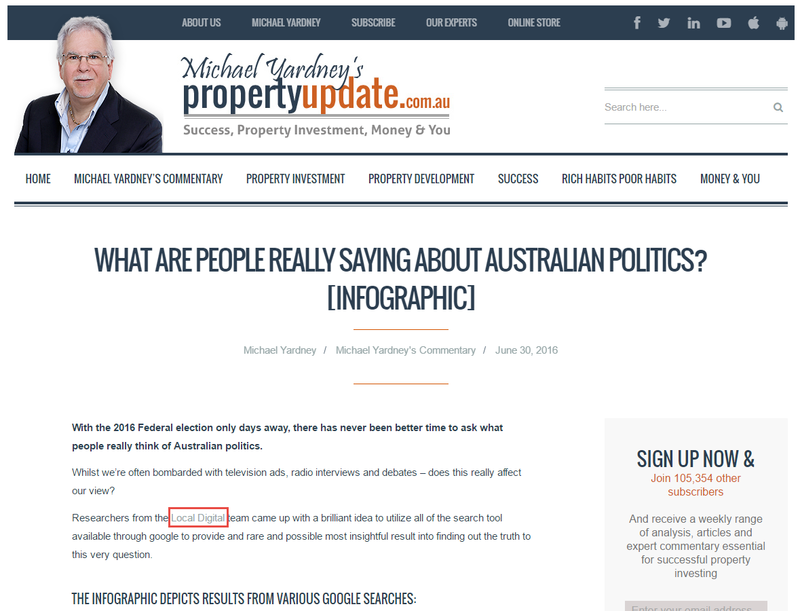 For example, another website that linked to the infographic was “Property Update”. This site has a DA score of 44 and a Majestic TF score of 16. Very decent metrics once again. This is a well-established site in the Australian property investment space, and they were interested in the infographic as it had a section dedicated to negative gearing. I won’t list any more, as there’s over 30 to get through. The point I’m trying to make here, though, is that the majority of these links came from strong websites, related to the topics covered in the infographic and that made sense to link back to our site. This is what any good SEO campaign should focus on when trying to earn links. I mentioned at the start of this article that we don’t really focus on the SEO for our own site. That’s because our team’s time is put towards working on client campaigns rather than for our own site. However, when we do get the time to run little experiments like this, the results are interesting. 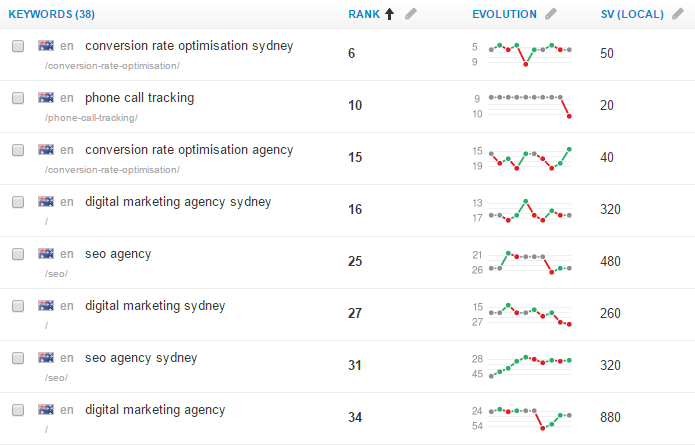 Before the campaign went live we had no keywords ranking in Google Australia. Yep… zero. That’s what happens when you operate in a competitive space with no links to your site! Since the campaign, we have noticed our site bouncing around page 1, 2, and 3 of Google for a range of high-value value keywords. Some of those keywords are extremely competitive terms, so we were impressed by how high they climbed. Hopefully, it helped illustrate just why links are such an important aspect of an SEO campaign. The important thing to remember is, not all links are built the same. By focusing on creating interesting content, promoting it to relevant audiences you can expect to earn high-quality links like the above. These are the types of links that will ultimately move the needle when it comes to your own SEO campaigns.